Good idea! i'd be interested. Maybe I’m interested. I’m not sure. I’ve only got Torment waiting for me, and I’m still chin deep in Oblivion, so not sure just yet. Would this be western RPGs then? Eagerly anticipating the first batch of potential games. I was just making sure I understood “classic RPG” to mean the type of games that have seen a revival lately in games like Pillars of Eternity, Torment, etc. or if it was broader or different than that. Just curious. I was just making sure I understood “classic RPG” to mean the type of games that have seen a revival lately like Pillars of Eternity, Torment, etc. or if it was broader or different than that. Just curious. I'd be down if we are talking Ultima 6 era or thereabouts. Probably in the minority here though. It would certainly give me some motivation for playing some of these. I've got a lot but usually burn out before I get very far. Some lively discussion would help. Caveat: I have grad school starting in about a week and am not sure what sort of free time I will have! I'm excited to see that there are others who might be interested in this! Thanks to all who have expressed some interest. Sorry, I don't think my original post was all that clear. To answer this, though, mainly... yes. I added "classic" to the post title to try to get at the idea of "non-Japanese RPGs published more than a year ago." I avoided "western" because I thought it might make people think of cowboys and the US frontier. But "classic" was probably misleading in its own right. My thought would be to intentionally keep things broad so that we could go in any direction we wanted within the RPG genre. So sure, Ultima 6 if enough people wanted to play it, or Baldur's Gate, or Fallout 3, or a game from the Might & Magic series, or Pillars of Eternity, or Torment, or Wizardry 8, or Oblivion, or Drakensang, or Wasteland 1 or 2, or Fable, or lesser known indie RPGs like Avernum and Geneforge, or Realms of Arkania, or Star Wars Knights of the Old Republic, etc. Heck, if the desire were there we could dip into an action RPG like Diablo or Torchlight. As long as the heart of the game is an RPG, it could be in. I hadn't really thought much about platform, or restricting platforms, but thinking about this now I'd imagine that most of them would exist more as CRPGs than on other platforms. The main thought was that there might be other people like me who have a number of older RPGs sitting in their backlog unplayed, and playing them together with other people might make the experience more fun, and help us to stay focused on the game until the end. It was probably plenty clear, I was just making sure I understood. I don't blame you for not using "western," that's probably not really a helpful term. Thanks for the further detail. "Classic" seems like a good choice, all things considered, and I have seen it used before. I always considered CRPG to stand for Computer RPG...a.k.a. "Western"-style. I avoided "western" because I thought it might make people think of cowboys and the US frontier. But "classic" was probably misleading in its own right. My thought would be to intentionally keep things broad so that we could go in any direction we wanted within the RPG genre. So sure, Ultima 6 if enough people wanted to play it, or Baldur's Gate, or Fallout 3, or a game from the Might & Magic series, or Pillars of Eternity, or Torment, or Wizardry 8, or Oblivion, or Drakensang, or Wasteland 1 or 2, or Fable, or lesser known indie RPGs like Avernum and Geneforge, or Realms of Arkania, or Star Wars Knights of the Old Republic, etc. Heck, if the desire were there we could dip into an action RPG like Diablo or Torchlight. Depending on the game, I'd be willing to give it a try. I own the majority of those you listed, and have rarely gotten more than 3 hours into any of them. Realms of Arkania: Star Trail is one of the first games I bought for my first IBM-compatible PC in 1996. I liked it, but then something more action heavy lured me away. I'd be interested in giving this a try, I have no shortage of qualifying RPG's in my pile and on my wishlist. Lol, yes, that's why I was thinking the term "classic" was a bit off target. Not that we couldn't play something that old, but it's probably not the main area of interest. Right! Yes, that's probably more in line with what I was imagining, except that we wouldn't necessarily rule out a non-computer game if there were interest in a particular game. Thinking on this some more, I wouldn't imagine we'd go down the route of an MMORPG, or a cruddy game. That we'd aim for good, non-Japanese CRPGs (mostly) older than one year with clear endings. And maybe that's our name? "The GWJ Good, Non-Japanese CRPGs (Mostly) Older than One Year With Clear Endings Club"
We could always go with "The GWJ CRPG Club" for short. Realistically, with these sorts of things, if we had 20 or so people following along, I imagine we'd have 5-10 people express interest in playing a particular game, and that maybe 1/4 to 1/2 of those who start would finish? But that would be a handful of people having fun playing and checking games off their backlogs every few months, and that'd be good enough for me. If I got three or four older RPGs off my backlog by the end of the year, I'd be happy with that side accomplishment. I for sure know I enjoy playing these more if others are playing at the same time, and the added accountability, however loose that might be, doesn't hurt either. Given that there seems to be enough interest, maybe I'll toss together some rough ideas for discussion on how we could select a game. If things go smoothly, we could probably start our first game, say February 1, which would have a nice stagger between the JRPG Club's start. If you want to poach any ideas on game selection from the JRPG Club, go for it. Basically arrived at via community discussion. I'd be up for Ultima VI or one of the Eye(s?) of the Beholder(s), with a little DOSBox effort they can look fairly decent nowadays. I don't really liked pixelation in my old school games, so I use a couple of scalers like Supereagle and 2xsai to smooth them out. 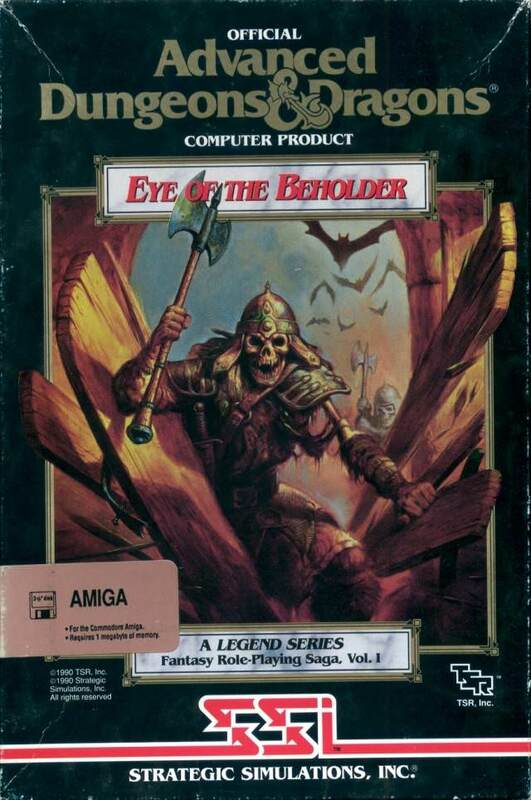 If we're throwing in nominations, Eye of the Beholder I would be my pick. Cool, thanks! I've been reading along with that thread, but will take a closer look at how you do it. - First, we have one week of nominations. Each member is allowed one nomination. Games nominated must have had their original (so a recent remake can be voted for) western release at least one year ago and not be a game the club has already played. - Next, we have one week of voting. Each member is allowed three votes, but can only spend one vote per game. However, they do not have to use all three votes. You can vote without having nominated anything! The only thing I'd be inclined to add would be that each game that is nominated during week one needs to have someone else "second" the nomination in order to make it to the second week. That way we could narrow down the outliers a little bit. You can second as many games as you like. Also maybe a little rewording of games that can be nominated to just: "Games nominated must have had their western release at least one year before the nomination month." I was originally thinking that we'd have one nomination round then two rounds of voting. The first round would narrow things down to three finalists, then we'd make a final vote. But as I think about how the JRPG Club does it, by giving each member three votes, it already kind of gets at the idea of covering a range of games that a majority of people would like to play, and it makes things much simpler. That's a good idea, makes things go faster, and helps pick games that a good number of people would be fine with playing. Ideas, thoughts, recommendations, random CRPG jokes? Also, I've added names to the first post of people who have expressed some interest. Let me know if I missed you! Lastly, I've tweaked the thread title to reflect the progress made. I'm definitely in if/when a game on backlog comes up, as I'm also doing the 'no buying games in 2018' thing so that I can get through a bunch of my backlog. Welcome welcome! I've added you to the list. When do we start with nominations? Just as an FYI, GOG has many of the older PC games available (that link is filtered for "RPGs" released pre-2000) for between $5 - $10. Many are already pre-configured with DOSBox out of the gate so you don't have to mess with any configurations on your own. So, even if a game you don't currently own gets nominated it's still possible to get in on the action. EDIT: Oh, and this is definitely something I'm interested in as well. Baldur's Gate II absorbed my attention in college to an extent that became a little troublesome. I will definitely be keeping an eye on the club. Since I am already on a computer all day for work, I've noticed that gaming on a PC has become really difficult, sometimes painful. Hence, my Pillars of Eternity game sitting at 2/3 finished. But if something is playable on console or perhaps is short enough to keep up via short sessions, I may be in to participate. Speaking of the GOG sale, and despite what I said above, I picked up Divine Divinity and Beyond Divinity for something like 55 cents each. I'll take the lack of questions/discussion on how to run the nominations as a blessing to move forward on it (thanks JRPG Club for breaking ground for us there! ), so how about this? If we did this, we could start February 1. Thursday, February 1: Gameplay Starts! We can work out the remaining details as we go through the nomination/voting process. Okie dokie, I've updated the first post with more information. All is open for discussion, of course, so let me know if something strikes you as off or needing adjustment. I was wondering, how long do people think we should take to play a game? I was thinking two months, but in the Gaming Goals thread people seemed to like 3 months, which is perfectly fine with me too. (Probably better, actually, given that people are busy and playing lots of other games too.) Another thought would be to determine the number of months by the average length of the game, so maybe less than 15 hours is one month, 15-30 hours is two months, anything longer would be three months. Ideas, thoughts, wishes? Thanks for the info! I've added you to the list!